If you had ham for Easter and still have that ham bone sitting around, this post is for you! If you threw out your ham bone, don’t tell me. I’m not sure we can still be friends. Well, we can still be friends if you promise to never throw away another ham bone. If you aren’t going to use yours, you can give it to me! That’s what my awesome neighbors did! They invited us for Easter dinner (which was fabulous), sent us home with leftovers (thank you for my lunches this week), AND gave me the ham bone. These are friends worth keeping! I made Slow Cooker White Bean & Ham Soup last week with a ham bone I already had in the freezer. I’ve mentioned before that even if you don’t do the whole ham, you can go to Honey Baked Ham and buy just the meaty ham bone. I always get 2 and pop one in the freezer. Sorry there is no ingredient photo but this is an easy one. 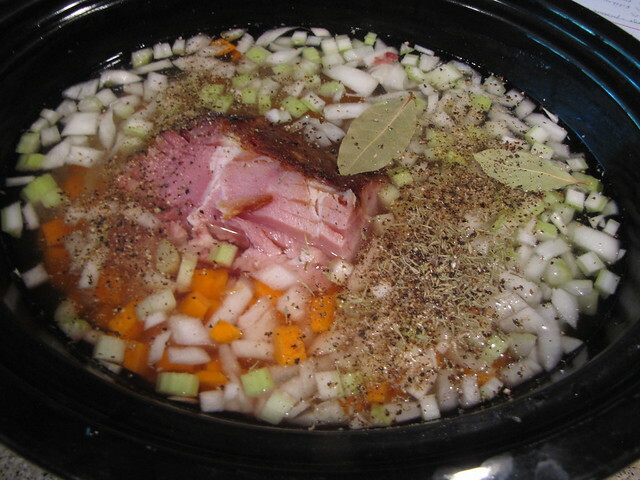 You need: Onion, Carrots, Celery, Dried White Beans, Ham Bone, Bay Leaves, Thyme, Rosemary, Salt & Pepper. OR whatever you have in the fridge/pantry that you think would be good in soup. Out comes the trusty crockpot because even though opera season is over, life is still crazy & busy. You already know that I have confessed to being a lazy crockpotter. 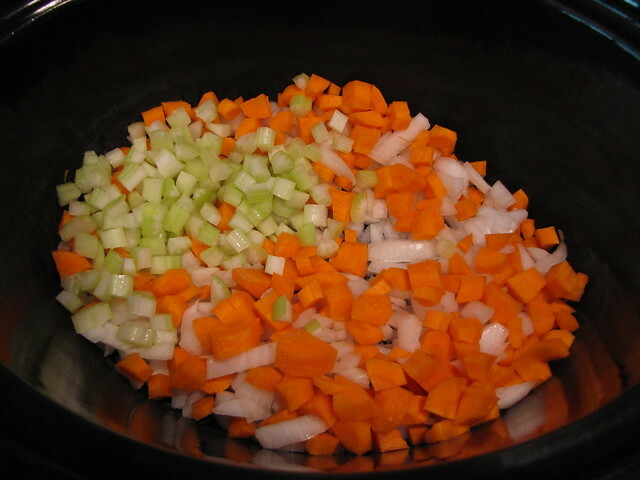 Up top I have 1 medium onion, 2 ribs of celery, and 3-4 carrots all chopped up and dumped in the pot. Then I added 1 pound of dried white beans (I think these are either white kidney beans or great northern beans…I didn’t have the package because I used these to blind bake a pie crust). No need to soak the beans. Pick through them to be sure there are no rocks or non-bean objects and give them a quick rinse. In they go. Nestle your meaty ham bone right in there. For better flavor, I usually take a minute to cut some of the good ham bits off of the bone before adding it to the pot. You can make a sandwich with them, or save them and toss them into the soup at the end. That way you have ham that has cooked all day and ham that is fresher tasting. Add 8 cups of water so you cover the ham bone. Toss in a couple of bay leaves, about 1/2 teaspoon dried thyme, and 1 teaspoon dried rosemary. Then set the crockpot to do its thing! This cooked for about 8 hours on low then sat there on warm for at least another hour until I could get to it, take out the ham bone, pick off any good ham bits and return them to the pot. Taste it and add extra salt & pepper to taste. If your soup is super thick, feel free to stir in a little more water to get it the consistency that you like. As you reheat this for leftovers, you’ll definitely want to add a little water as the beans continue to absorb the liquid as it hangs out in the fridge. There are several other soups here at Idiot’s Kitchen that would be good options for your ham bone. 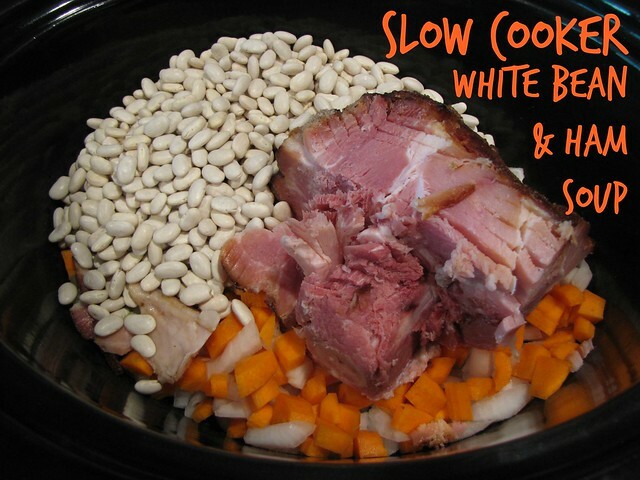 Slow Cooker White Bean & Ham Soup shown here is sort of a combo of my Ham & Navy Bean Soup and my Every Bean Crockpot Soup. I’m using my Easter ham bone (thanks again, Jody!) 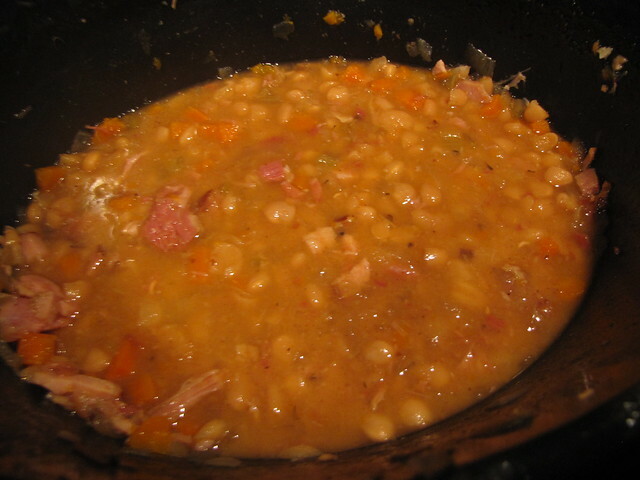 to make Split Pea Soup this weekend. I’m also a BIG fan of Ham & Potato Soup. I think ham bones make a great gift! What do you do with your ham bone? My easter ham didn’t have a bone! But it made good soup anyway! It’s all about the ham! Looks yummy! I generally find it helpful to run my old-fashioned slow cooker for an hour on high to get things off to a good start before I turn it down to low. This assumes that I am actually there to turn it down, of course. . . I think there are new-fangled cookers you can program for different timed settings? ?